A novel nanoscale sensor needs no power source. Nanoscale sensors have many potential applications, from detecting disease molecules in blood to sensing sound within an artificial ear. But nanosensors typically have to be integrated with bulky power sources and integrated circuits. Now researchers at Georgia Tech have demonstrated a nanoscale sensor that doesn't need these other parts. Zhong Lin Wang, professor of materials science at Georgia Tech, has previously used piezoelectric nanowires to make nanogenerators that can harvest biomechanical energy, which he hopes will eventually be used to power portable electronics. 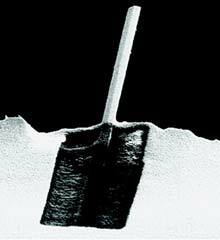 Now Wang's group is taking advantage of the semiconducting properties of zinc oxide nanowires--the electrical potential generated when the new nanowires are bent, allowing them to act as transistors. The Georgia Tech researchers used a vertical zinc oxide wire 25 nanometers in diameter to make a field-effect transistor. The nanowire is partially embedded in a substrate and connected at the root to gold electrodes that act as the source and the drain. When the wire is bent, the mechanical stress concentrates at the root, and charges build up. This creates an electrical potential that acts as a gate voltage, allowing electrical current to flow from source to drain, turning the device on. Wang's group has tested various triggers, including using a nanoscale probe to nudge the wire, and blowing gas over it. Wang's group is "unique in using nanostructures to make something like this," says Liwei Lin, codirector of the University of California, Berkeley Sensor and Actuator Center. Nanowire sensors could be used for high-end sensing devices such as fingerprint scanners, Lin suggests. The next step is to make arrays of the devices. "This is challenging because you have to make the electrical contact reliable, but we will be able to do that," says Wang. The image above is a CAPTCHA — you can read it, but computers have a harder time interpreting the letters. We tried to make it hard for computers to recognize because we wanted to give humans the scoop first, but we're happy to announce to everybody now that Google has acquired reCAPTCHA, a company that provides CAPTCHAs to help protect more than 100,000 websites from spam and fraud. In this way, reCAPTCHA’s unique technology improves the process that converts scanned images into plain text, known as Optical Character Recognition (OCR). This technology also powers large scale text scanning projects like Google Books and Google News Archive Search. Having the text version of documents is important because plain text can be searched, easily rendered on mobile devices and displayed to visually impaired users. So we'll be applying the technology within Google not only to increase fraud and spam protection for Google products but also to improve our books and newspaper scanning process. That's why we're excited to welcome the reCAPTCHA team to Google, and we're committed to delivering the same high level of performance that websites using reCAPTCHA have come to expect. Improving the availability and accessibility of all the information on the Internet is really important to us, so we're looking forward to advancing this technology with the reCAPTCHA team. Après la fonte créée spécifiquement pour pouvoir être lue par les machines (on pense ici bien entendu à l'OCR), le CAPTCHA est apparu bien plus récemment avec l'objectif exactement contraire: ne pas pouvoir être lu par les machines... (pour les raisons que l'on sait d'éviter les logins automatiques et autres spams de listes ou siztes divers). On avait réalisé un projet en 2004 (Electroscape 004) exploitant du "text to speech" et il y a peut-être un projet inverse à faire avec ça aujourd'hui...? Augmented reality (AR), which involves superimposing virtual objects and information on top of the real world, may be coming to a phone near you. As mobile phones become packed with more sensors, better video capabilities, and faster processing power, many experts predict that AR will become increasingly common. But in a panel discussion today at EmTech@MIT in Cambridge, MA, panelists will admit that several obstacles still remain and that the "killer app" for augmented reality has yet to emerge. Several AR apps have already been released for cell phones with positioning sensors. For example, PresseLite's Metro Paris app and Acrossair's Nearest Tube both provide iPhone users with augmented directions to nearby subway stops. AR apps are also available for phones powered by Google's Android platform. Layar, developed by SPRXmobile, based in the Netherlands, overlays information from Twitter, Flickr, and Wikipedia on real-world locations, while Wikitude, from Austria-based Mobilizy, displays tourist information collected from Wikipedia. Some researchers believe that AR represents a fundamentally new way to organize and interact with information. "In the future, we see augmented reality as a component of any kind of digital media interaction," says Mobilizy's CEO, Alexander Igelsboeck, who will speak at the EmTech@MIT session. This week Mobilizy released a new language for AR called Augmented Reality Mark-up Language (ARML). With ARML, Mobilizy hopes to make it easier for programmers to create location-based content for AR applications. The company envisions ARML as equivalent to HTML for the Web, and Igelsboeck emphasizes the importance of open content and standardization for AR to take off. "We want to open those standards to be available for developer communities that can create innovative applications around this augmented experience," he says. But many challenges still remain. For instance, the positioning technology currently available in cell phones falls short for sophisticated AR applications. The GPSs built into smart phones "were really not designed for AR," says panelist Steven Feiner, a professor of computer science at Columbia University. "They were designed for simpler applications." 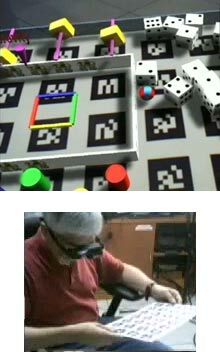 Feiner, who has worked on AR for over a decade, notes that early examples of AR required wearing a computer backpack and using cumbersome head-mounted displays. "[But] the tracking that we used [in 2001] was much, much better," he says. 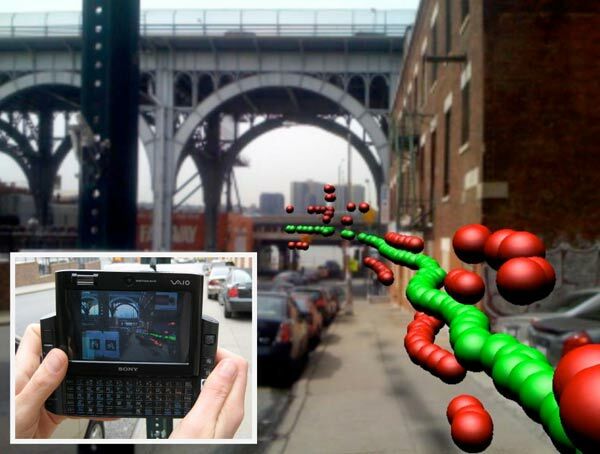 Feiner is focusing on less-mainstream applications for AR--he has developed one program that shows levels of carbon monoxide in Manhattan (see image above), and another that shows virtual labels for engineers--for example, a floating tag that says, "Remove this bolt using a 1/4 inch socket wrench". He adds that better object recognition and posture tracking, as well as a way to deal with direct sunlight, will help AR become more practical. Another potential obstacle for AR is social acceptance. While people already text or check e-mail while they walk, looking through a phone can be awkward. Feiner suggests that well-designed goggles could help. "There's a very high bar of what people are willing to wear on their heads," he says. "Your world can be augmented without you having to change your behavior and do anything extra [like] taking out your cell phone and starting an application," says MIT professor Pattie Maes, who heads the SixthSense project. Maes's group is also exploring technical applications for AR. "If my car stops working, I might open the hood and an expert might remotely see what I see and [then] project information in front of the engine, saying things like, 'Open this valve,'" explains Maes. Nokia's Mobile Augmented Reality Applications and Mixed Reality Experiences projects aim to use a combination of hardware in AR applications. Ville-Veikko Mattila, a principal researcher at Nokia Research Center, believes that combining visual and audio information could be most practical. "I think it's clear that people won't be walking and holding a device upright. Therefore, the use of audio may be more intuitive," he says. Mattila adds that AR could potentially combine social information and location-based services to give user-tailored recommendations. For example, an application could show what your friends think of a particular restaurant, instead of providing a guidebook's reviews. "There's a lot of hype obviously," Feiner says. But ultimately he agrees that AR may be able to help people with their daily lives. "Like being able to get somewhere, find information, or recognize a face of a person you know, but can't remember the name of," he says. 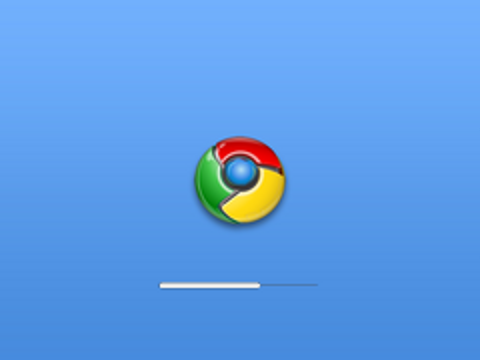 Google’s Chrome OS is now available to download. The search giant first announced its plans to release a desktop OS back in July, and this is the first “early development” build available to the general public. With it you get the GNOME 2.24 desktop environment, Google’s own Chrome 4.0.206 web browser and the OpenOffice.org 3.0 office suite if you really need to get some work done. Since you’ll probably be more excited about “living in the browser” like Google expects us to all eventually be doing, you’ll be pleased to hear there’s an Adobe Flash Player 10 plugin too, so streaming video will work. Recent interviews with the Google exec team suggest that Chrome OS may end up moving closer to Android at some point in the future, but for now it’s a standalone platform that they expect to see hitting production netbooks sometime in the second half of 2010. 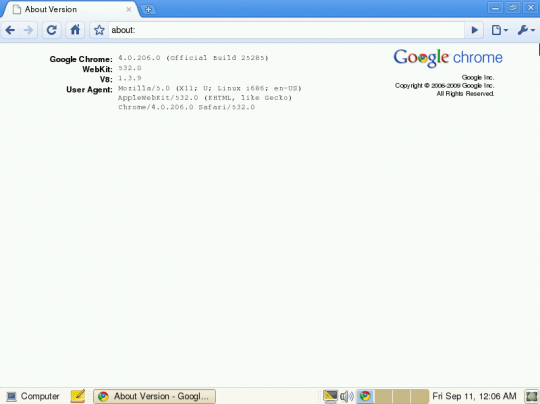 You can find the 476MB Google Chrome OS download here. 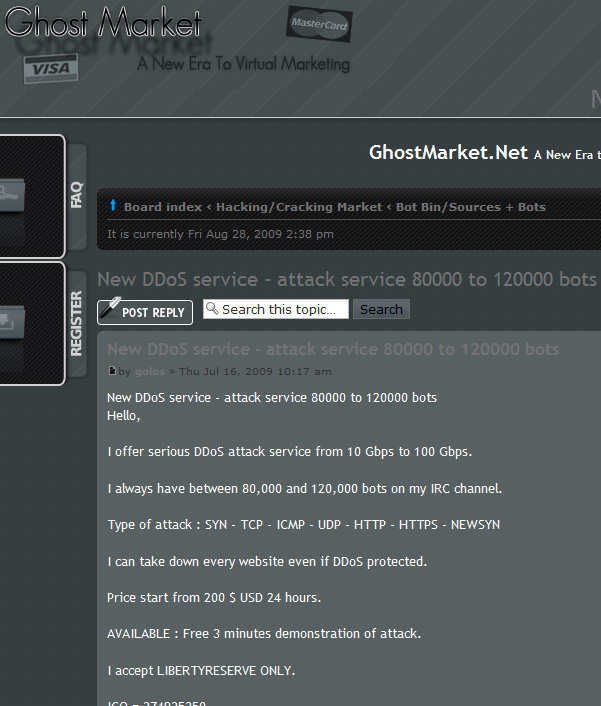 Want to rent an 80-120k DDoS Botnet? Over recent weeks there has been a lot of interest in DDoS botnets – that is to say, rentable botnets that provide DDoS as a managed service. I’ve spoken to a number of people about how easy this is to do, and how practically anyone who happens to know how to use a popular Internet search engine can probably locate the sellers or the hacking message boards they hang around. Perhaps one of the finer points missing about the discussion of renting DDoS botnets pertains to the size. As you can see from above, this particular operator is offering a botnet of between 80k and 120k hosts capable of launching DDoS attacks of 10-100Gbps – which is more than enough to take out practically any popular site on the Internet. The price for this service? $200 per 24 hours – oh, and there’s a 3 minute try-before-you-buy. By way of another example, the following screenshot is from another botnet master offering a 12k botnet for rent – for the price of $500 per month. Screenshots like this appear to be popular as a means of validating the sellers claims of the size of their botnets – despite the fact that all of this information can be trivially forged. Notice that only a handful of bots appear to be online and currently accessible? 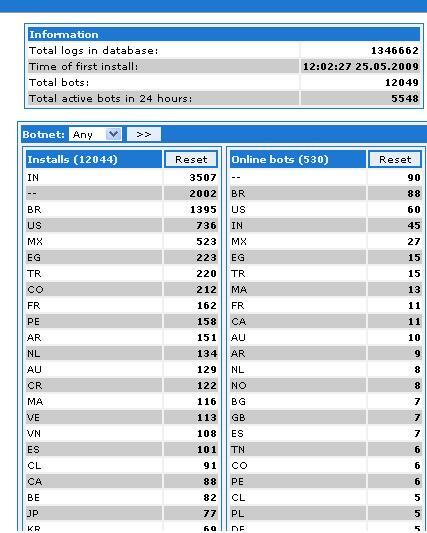 (this ties in to what I was saying the other day about counting botnets). There are of course plenty of other operators that work this way – offering DDoS managed services – and there’s lots of competition amongst them. What’s perhaps most amusing about this botnet market to me is the fact that so few sellers have “good” reputations – and the message boards are rife with competitors throwing mud about the quality of the service or that the “seller” is actually just running a scam on newbie buyers. I’d encourage readers to keep an eye on these kinds of hacking portals – just make sure you only access the sites from VM/sandboxed disposable hosts since many of the sites attempt to hack your Web browser. You’ll uncover lots of information about the mainstream botnet seller/renter market and, just as importantly, details about many of the newer or popular DIY botnet creation kits out there.